Does your child have the mid-summertime blues? You know, where they have done everything they could think of to have fun, and are looking for somewhere to go to get some more fun in before summer vacation is through? One option to help cure your child’s summertime blues would be to take them to Calypso Theme Waterpark! This is my big kid. She was one of these kids who were suffering from the summertime blues. Since she has NEVER been to a water park, I thought that I would surprise her by taking her to Calypso in order to change things up in her routine. Why would I take my big kid to Calypso Theme Waterpark? Well, there is so much to do and explore! There are 35 heated state-of-the-art water slides for my child to ride! If the water slides are not her cup of tea, there are 2 themed rivers, Canada’s largest wave pool, and over 100 water games for her to try. 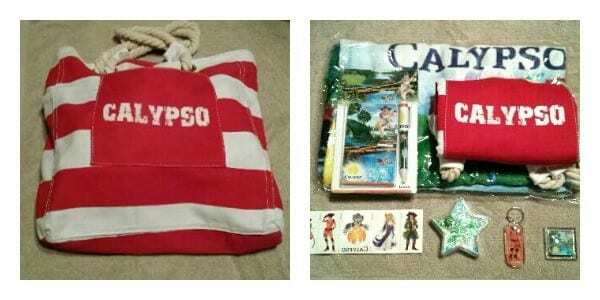 When we arrived at Calypso, my family was treated with a gift tote bag! It is so cute and is the perfect size for carrying around the essentials you would need for a day at Calypso. It also included some great items that we could use either at the park, or at home to remember our trip to Calypso. As we entered Calypso Theme Waterpark, my daughter was in awe as she saw some of the slides. To get her ready for slipping and sliding down the zippy slides, we headed towards Calypso Palace. At first, she was not too sure about the waves, but I assured her that we would be safe. Besides having me at her side, I was able to see a lot of life guards on duty to help anyone that needed it at this part of the park. At Calypso, there are 600 trained staff members to help guests that need assistance, including 125 life guards and 50 trained slide attendants ready to come to the aid of visitors of the park. She went in the wave pool with our family, but was content to stay at the shallow end. I let her know that this was okay, because there was so much more to see and do at Calypso. My family needed to take a break, and we found a spot by one of the many landscaped picnic areas at Calypso to dry off a bit. My daughter thought it would be a good idea to rest up near a tree for some shade and wrap herself up in her towel. Once we were a little drier, we realized that we were hungry. Since we were close to the Main Street Restaurant, we decided to stop in for a bite to eat. We tried their pizza, hot dogs, hamburgers and French fries, along with their fountain drinks to help wash down our meal. We also liked being able to sit down at tables that were shaded by umbrellas while we feasted! 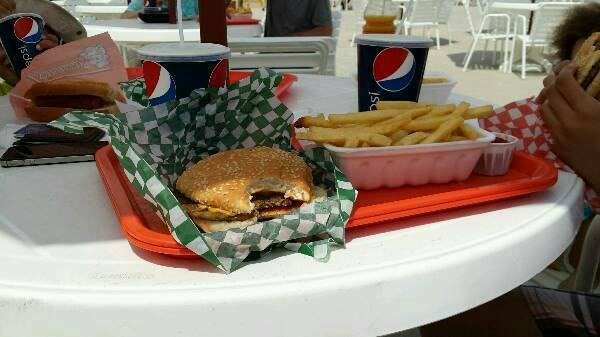 Calypso Theme Waterpark has 8 different themed restaurants for guests to eat at. Whether a quick snack is needed, or something more substantial is in order, Calypso has diners covered all over the park, so visitors are never far away from something to eat! While the little ones were with their dad, my big kid and I headed over towards some of the amazing slides that Calypso is so famous for! We went over towards Fast Track, a series of hilly slides where you can race your friends or other guests to the bottom. I thought that she could start off on a fun-looking slide where we could race each other and have fun. She said she wanted to keep her feet close to the ground for a bit, so I gave this slide a try to show her how much fun the slide was! I was right, it was a rush! I laughed as I glided down the slide to a splashy end on my mat. Before meeting up with our family, I went on one other ride to get a feel for what the another slide was like. Adrenaline was a fast, twisting ride down the walls of the track! It was a quick ride, but it was a lot of fun, too! I am so happy that Calypso has more than just fantastic slides to amuse their visitors! My eldest had an amazing time on the 2 themed rivers at the park. The first river we rode on was the award-winning Kongo Expedition. We lounged on flotation devices along a winding river that held animals and waterfalls around some of its bends! It was also fun to go through the tunnel that was illuminated to show off some of its inhabitants. We then went on my daughter’s favourite attraction: Jungle Run. While holding on to flutter boards, we were whisked away by the current as we went under bridges and waterfalls. There were also various jungle friends calling to us as we were carried around this river. She rode this attraction a few times and had a blast! Alas, we had to think about heading home. 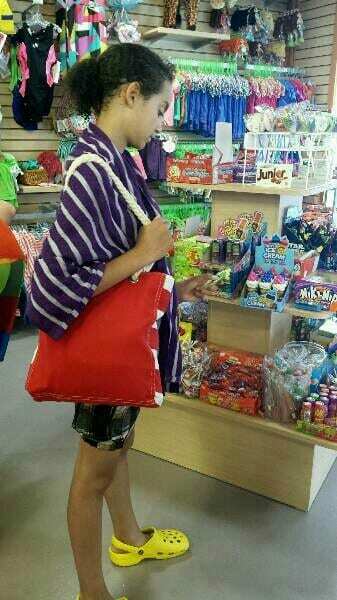 Before we left, we visited the Calypso Friend’s Boutique so my daughter could have a memento of her day at the park. What did she pick? Candy! She picked out a package of Choco Rocks because she thought they were interesting and had never eaten them before. 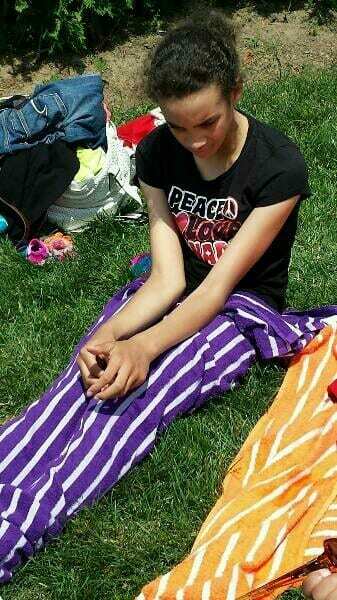 My daughter had a great time at Calypso Theme Waterpark. She may have not gone on the slides, but Calypso was still able to keep her happy and amused on their themed rivers! I got to be a big kid for a while zipping down some of Calypso’s thrill-seeking slides and splashing about at Calypso’s Palace. Maybe my eldest will try going on a slide with me on our next visit to Calypso, so we can try out even more of what Calypso Theme Waterpark has to offer. I can’t wait for our next visit! It looks like so much fun! I’d love to try out the slides and wave pool, but I think the winding river with waterfalls and animals would be my favourite part. Wow that looks like one awesome place to be in the summer. Haven’t been to a water park in years….I should make it happen before summer’s over eh! Great photos, looks like you all had a great time! Hi Laurie P! I hope you do make a trip to Calypso Waterpark! You and your family would have a good time! Wow looks like a great water park! Where is it located? Glad it helped to fix some of the summertime blues!! Hi Judy! Thanks for replying! Calypso is a great water park. It is located in Limoges, ON, and is about 40 minutes east of Ottawa. It really did fix my daughter’s summertime blues. She wants to go back, too! Calypso is an amazingly fun place. I’m not to big on the slides either. I LOVE the Lazy River! I could spend the entire day in there! This looks so fun! I would love to visit this park! Hi Victoria! It really is a great park to take your family to! I hope you get to go before the end of the summer! It looks like you had a fabulous trip. We haven’t been yet – I’m thinking once my kids are a bit older – maybe next summer :). Hi Kathy! It is a beautiful place! I love how there was something for everyone to enjoy at Calyspo, and you will not get bored! Hi Kathy! It is a great place to take your family for some summertime fun! I hope you and/or your friends attend next year! It was great to take my “Big Kid” to Calypso! You and your grand kids would love spending the day beating the heat in the water. There is a section that everyone in the family would enjoy. I hope you and your family get to go next year! We received passes for Christmas and we are SO excited! We enjoyed our first visit to Calypso last summer and had an amazing day. We found the park clean and full of activities that lasted all day. Bring on the summer! Those water slides are totally fun!